Just wanted to say my son gave me a massive hug tonight and said thank you for the best birthday ever. Thank you for making the journey to us and keeping patience with the boys. We are so glad we found you guys, you do an amazing job and hope to see more of you in the future. I'm sure I can hear my son sleep talking about chameleons." I am writing to you as I would like to reiterate my satisfaction and Thanks with regards to your attendance at my son's birthday party. It was a large group of mainly 6 year olds and lots of adults. 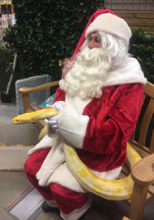 Without doubt the party was a great success due to the professionalism you showed, the knowledge of the reptiles and of course reading the reactions of the children. My wife and I have been constantly told by parents of those children that were there that it was a great idea for a party and handled very well. I hope from these comments some more bookings will take place. Hazel attended my son's party 7 years ago, with Jack last week we will definitely book you again when our baby reaches a suitable age." "We just wanted to say a big thankyou for making Claudia's 6th birthday so special. 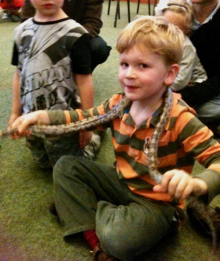 You were absolutely amazing and it was a delight to see how you intergrated children and reptiles into such a fun but none the less valuable learning experience. Claudia really adores all creatures and was thoroughly excited by the opportunity of sharing some time with your beautiful friends. She didn't seem to have a favourite she loved them all finding something special about each one. 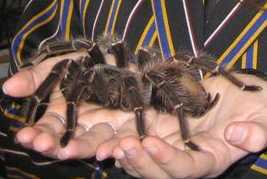 She was however thrilled at being able to hold such a handsome tarantula (this has been on her wish list for some time). She now would like to learn more about chameleons as maybe one would befriend our 40 year old tortoise. We feel you provide a good reference for these young children to feel comfortable with 'diffferent' creatures and hope that this will help them to nurture kindness and consideration towards their pets and other animals. Thankyou and your friends for widening our horizons and providing us with the most splendid time. Looking forward to renewing acquaintances." You came to our house for Gemma and Ethan's birthday party on Sun 19th Sept. I just wanted to thank you and your daughter for doing such a fantastic job. We usually just do our own old fashioned parties, but this year's really was a party to remember. The animals were beautiful and you had a lovely way with the children. Word has really spread and several parents have asked for details about your parties. I directed them to your website." Available for children's birthday parties, grown-up's parties, kids clubs, scouts, brownies, cubs, weddings and virtually any other event you might be putting on! 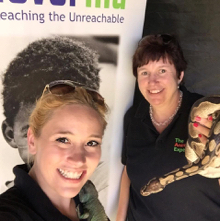 A hands-on experience with our wide selection of rare and unusual animals, from milksnakes to meerkats, tarantulas to tree frogs, and eagle owls to 4m long python allow us to offer a hands-on experience that your guests will never forget! 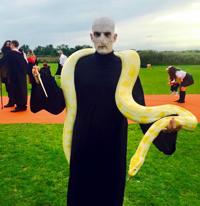 "Without doubt the party was a great success due to the professionalism you showed, the knowledge of the reptiles and of course reading the reactions of the children. We will definitely book you again"
With 24 years and over 2000 parties worth of experience, you can be confident in choosing The Animal Experience whatever your event. Prices for an hour-long party start at just £150 (+VAT), we travel nationwide (extra charge for distance travelled), and we can put together a package to suit your individual preferences and requirements. If required during the summer months we can bring our gazebo (for a fee). See below or contact us for more details. Why settle for balloon animals when you can have the real thing! Let us come and entertain your child and their guests with our amazing selection of animals for a guaranteed hit with children and adults alike. Choose from one of our popular packages (such as reptiles and mini beasts, fur & feathers or a mix of the two), or tailor make a package of your own. Our typical format lasts approximately 1 hour and is suitable for ages 5 and up. We introduce the children to all of the animals and tell them a bit about each of them making this educational as well as fun. Then there will be an opportunity for the kids to hold and interact with the creatures individually. Maximum group size 20 (although we find 10-15 is ideal). The Animal Experience is also available for kids' clubs, and we regularly visit a wide variety of groups including clubs, brownies, scouts, youth groups and children's charities. Like all of our events, you can either pick one of our standard packages or we can tailor make a package just for you. Our typical format lasts approximately 1 hour and is suitable for ages 5 and up. Maximum group size 20. The Animal Experience is not just for children! Our rare and unusual animals are guaranteed to delight all ages, and we are regularly involved in a wide variety of functions and events including weddings, christenings, fetes and fairs. 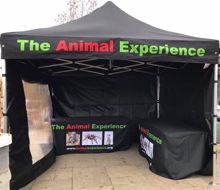 We can set up in a room, a tent, or our own gazebo and guests can spend time meeting the animals and talking to the team, with the opportunity to handle some of the species. If you like you can charge your visitors a separate fee for entry to the Animal Experience. Whatever your event, contact us to discuss your detailed requirements. A team building day with a difference. We will provide our reptiles for your staff to interact with. The staff at Jacksons Engineering had a series of sessions on the theme of Its a jungle - get me out of here. The managing director was delighted to overcome his phobia and hold the Goliath Bird Eating Tarantula! We can attend for an hour or more for an interesting break between meetings, guaranteed to be a talking point for days/months to come! Please contact us for more details or to discuss your requirements.